The spinal cord is an important information relay and processing hub connecting the brain with the rest of the body. A transverse section of the spinal cord reveals a distinct “butterfly” pattern of dark, inner “grey” matter surrounded by the lighter colour “white matter”. The white matter contains the ascending and descending pathways connecting the brain and spinal cord (see relevant articles). This article will focus on the organisation and function of the spinal cord grey matter. Spinal cord grey matter can be functionally classified in three different ways: 1) into four main columns; 2) into six different nuclei; or 3) into ten Rexed laminae. The dorsal horn (also known as the posterior horn) contains neurons that receive somatosensory information from the body, which is then transmitted via the ascending pathways, to the brain. The ventral horn (also known as the anterior horn) largely contains motor neurons that exit the spinal cord to innervate skeletal muscle. 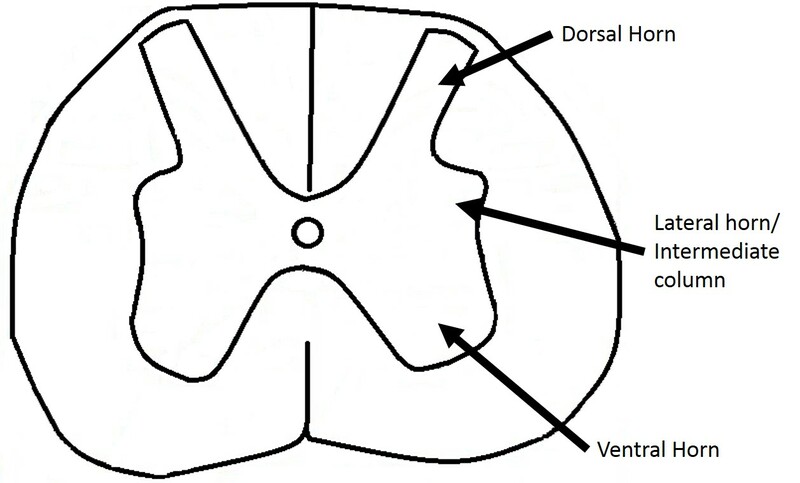 The intermediate column and lateral horn contains neurons that innervate visceral and pelvic organs. Fig 1 – The four columns of grey matter in the spinal cord. Marginal zone (MZ, posterior marginalis) – located at the tip of the dorsal horn, and is important for relaying pain and temperature sensation to the brain. Substantia gelatinosa (SG) – located at the top of the dorsal horn, the SG is important for relaying pain, temperature and light touch sensation to the brain. Nucleus proprius (NP) – located in the ‘neck’ of the dorsal horn, the NP relays mechanical and temperature sensation to the brain. Dorsal nucleus of Clarke (DNC) – the most dorso-medial nuclei, the DNC relays unconscious proprioceptive information to the brain. Only found in spinal segments C8 to L3. Interomediolateral nucleus (IMN) – located in the intermediate column and lateral horn, the IMN relays sensory information from viscera to the brain, and autonomic signals from the brain to the visceral organs. Lateral motor neurons and medial motor neurons (MNs) – located in the ventral horn. Composed of motor neurons that innervate visceral and skeletal muscles. 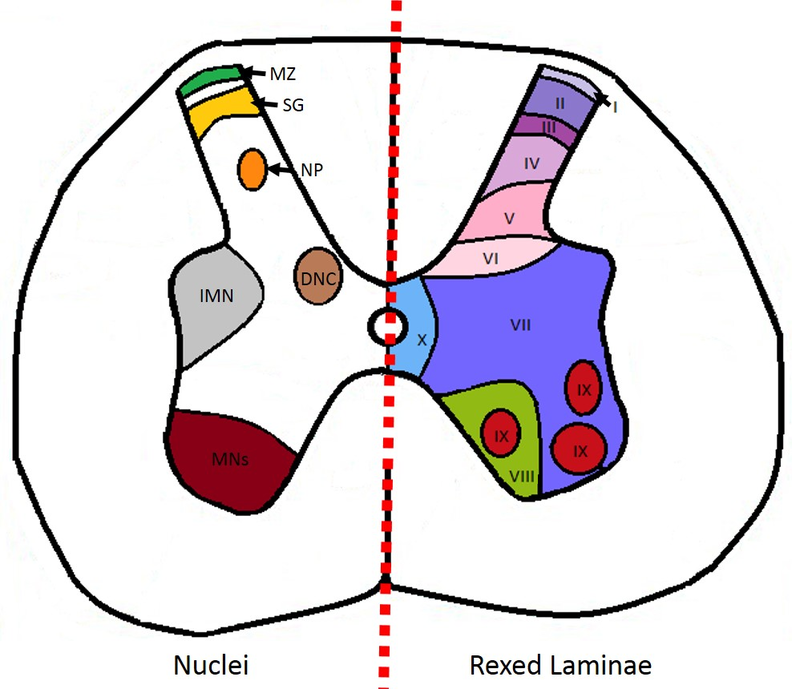 As an alternative to spinal cord nuclei, Bror Rexed (1950s) identified layers, or laminae, within the spinal cord where cells were grouped according to their structure and function, rather than solely on location (figure 2). Involved in sensation of noxious and non-noxious stimuli, and modulating sensory input to contribute to the brain’s interpretation of incoming signals as painful, or not. Involved in proprioception and sensation of light touch. Cells in this layer connects with cells in layers IV, V and VI. Involved in non-noxious sensory information relay and processing. Receives descending information from the brain via the corticospinal and rubrospinal tracts. Receives sensory information from muscle spindles (involved in proprioception). Large, heterogenous zone that varies through the length of the spinal cord. Distinct groups of motor neurons that innervate skeletal muscle. “Referred pain” occurs when visceral pain, for example from angina (pain arising from heart muscle that does not have an adequate blood supply), is felt as cutaneous pain, for example, in the left arm and hand. Referred pain occurs because there are few, if any, neurons in the dorsal horn that solely send signals of visceral pain to the brain. Thus neurons sending signals from the viscera, are also involved in sending signals of cutaneous pain, resulting in potential confusion of the source of the pain. However, certain types of visceral pain are associated with specific patterns of cutaneous referred pain, and thus understanding these patterns can aid in diagnosis of the underlying cause.